Jonas Netter, Paris, by circa 1925, and thence by descent to the present owner. M. Gauthier, Art Vivant, 15 May 1930, p. 422 (illustrated fig. 75). P. Courthion, Soutine, Peintre du déchirant, Paris, 1972 (illustrated p. 175, fig. B, dated '1914'). M. Tuchmann, E. Dunow & K. Perls, Chaïm Soutine (1893-1943), Catalogue Raisonné, vol. II, Cologne, 1993, no. 5, p. 528 (illustrated p. 530). Paris, Théâtre Pigalle, Art vivant, May 1930, no. 84.
no. 1 (illustrated pp. 19, 150). Paris 1910-20, April - May 1997, no. 9 (illustrated p. 43); this exhibition later travelled to Osaka, Kintetsu Museum of Art, June 1997; Yamagata, Yamagata Museum of Art, July - August 1997; Niigata, Museum of Art, September - October 1997; Miyazaki, Museum of Art, November - December 1997; Kitakuyushu, Municipal Museum of Kitakyushu, December 1997 - January 1998 and Tokyo, Daimaru Museum of Art, January - February 1998. 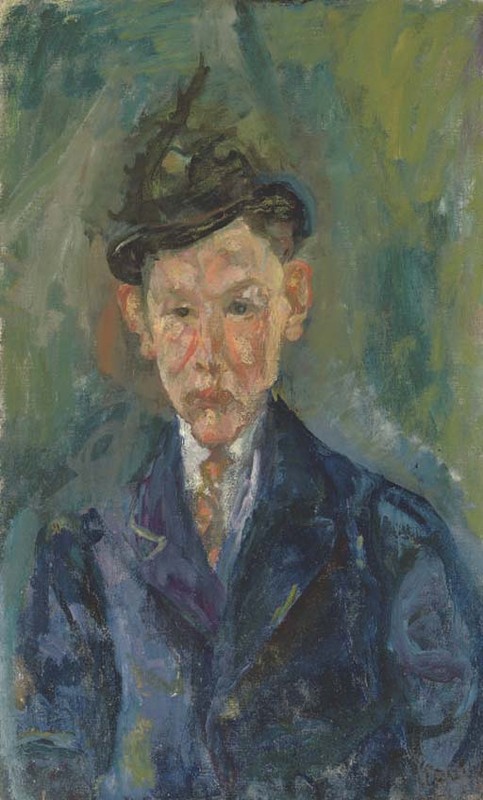 Painted circa 1916, Le jeune homme au petit chapeau is one of the earliest of Soutine's surviving portraits, dating from several years into his stay in Paris. He had arrived there, from Minsk and before that his shtetl in Lithuania, and had immediately sought out fellow artists and studio space. Despite his abject poverty, or perhaps because of it, he had found space in the legendary Cité Falguière by the time Le jeune homme au petit chapeau was painted. Amongst the artists there was the notorious Amedeo Modigliani, and within a short time this unlikely pair-- the reclusive, unsophisticated youth from the shtetl and the far more cosmopolitan, outgoing, charming Italian-- had struck up a firm friendship. Modigliani's influence as a painter can be perceived in Le jeune homme au petit chapeau by the composition, which focuses, to the point of obscuring the entire background, on the subject and especially the flesh tones of the face. But Soutine shows a vividly different interest in the face from his friend Modigliani. Where the latter-- who had only just returned to painting having been forced, for health reasons, to abandon sculpture-- painted portraits intended to reveal the grace of humanity, Soutine's focus on the flesh of the face shows an obsession with expressing a far more earthy life force, and indeed a concern too with mortality. There is a meatiness to the texture of the face in this painting that is a far cry from the masks in Modigliani's portraits of the same period. It was only in the later part of his career that Modigliani used anonymous models from everyday life, rather than his friends. By contrast, Soutine painted only a handful of pictures in which the identity of the sitter is known, or indeed was important. Instead, he sought out normal people, using them to reveal the pulsing stuff of life that intrigued him so much. It was in part his love of the painterly, in part his fascination with flesh, that led Soutine to one of his other great influences: El Greco, whose influence is clear in Le jeune homme au petit chapeau. Soutine was fascinated by the Old Masters, to which he was constantly exposed-- not least because, during the colder months, he would huddle in the Louvre before the masterpieces as a means of staying in the warmth. The paintings of his illustrious predecessors provided a ceaseless visual impetus for Soutine, and nowhere is this more clear than in Le jeune homme au petit chapeau, where the darkness itself appears to have been taken from the brooding Old Masters that intrigued him so much.